Society is now (finally!) recognizing that chronic stress creates a multitude of health issues. In response, the use of breathing techniques for better health—which used to be thought of as new-age mumbo-jumbo—is becoming more widely accepted. The latest science confirms that breathing and meditation can reduce stress levels and everyone from the New York Times to WebMD is reporting on it. In my last blog, I detailed how your breathing has far-reaching effects, from your posture, to your digestion, and even your levels of pain. This blog dives into how you can control your brain with breathing. You’re anatomically and physiologically wired to use breathing to alleviate stress and fix a variety of other things. So, put on your thinking cap, brace yourself for a few paragraphs on the brain stem and then get ready to breathe. This is the area where your spinal cord attaches to your brain. It is very important because it oversees your vital functions: things like breathing, heart rate, blood pressure, digestion, etc. The brainstem is also where your sympathetic nervous systems (SNS, “fight or flight”) and its counterpart, the parasympathetic nervous system (PSNS, “rest and digest”) begin. The mid-brain, at the top closest to the brain itself. The pons, which is in the middle. The medulla, where the spinal cord attaches. You can think about these three brainstem areas being like the three branches of government. When all three work well together, it’s a beautiful system of checks and balances. When they don’t, things can get a little out of whack. The mid-brain receives information from your external senses. It’s also where your SNS starts. The mid-brain must integrate all that sensory information and then decide how to stimulate your life functions via the SNS. If it thinks you’re in trouble, your breathing gets shallow and speeds up (panic mode!). You might also feel like you’re collapsing in on yourself (scared mode). That’s because the mid-brain controls postural flexion and rapid breathing can stimulate it. The pons, in the middle of the brainstem between the mid-brain and medulla, is designed to help you calm down. It acts as a check and balance to inhibit the SNS. The pons is also in charge of postural extension, which helps undo the mid-brain’s flexion response. Take a long, deep inhale, which will stimulate the pons. You’ll notice your whole body lifts and extends. 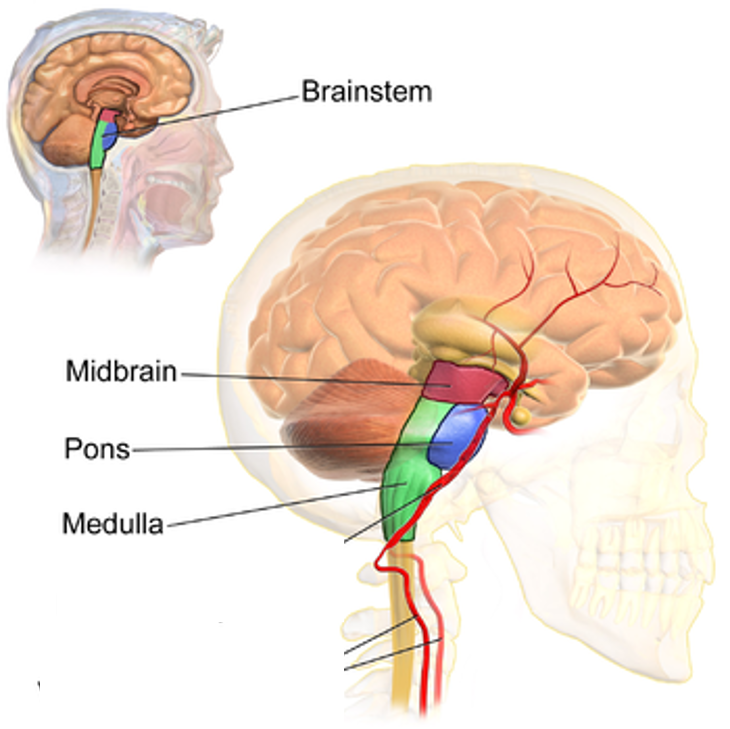 Lastly, the medulla lies at the base of the brainstem, below the pons. It helps regulate both the pons and the mid-brain. Like the pons, the medulla can inhibit the SNS. It also counteracts an overactive pons by inhibiting postural extension. Taking long slow exhales stimulates the medulla (it’s the reversal of the extension associated with the pons and deep inhales). Additionally, the medulla connects your vagus nerve to the brain. This “wandering nerve” talks directly with your gut and carries your PSNS signals. Stress – The SNS is your stress response. To inhibit it and stimulate the PSNS, breathe deep. If you need to wake up, breathe fast. Posture – The brainstem controls posture, specifically the balancing act between the pons and medulla. Want to get taller, think pons. Have too much of the straight back, military posture going on, try the medulla. Digestion – Breathing deeply moves the diaphragm, which presses down on and moves your organs. This also stimulates the medulla via the vagus nerve, stimulating your PSNS (rest & digest system). Pain – The pons and medulla act as a gate for pain signals. If they’re working well, unnecessary pain signals don’t get through. Now that you know how powerful different types of breathing are, put them to work whenever you want. Your brain is largely under your own control!